Don’t just play your music to dustballs behind closed doors anymore! The Sonoma County Fair is looking for young talent, so bring your garage band out to play in the Battle of the Teen Bands! The competition will be held in Community Theater (previously known as Redwood Theater) on Saturday, Aug. 11. Groups will be awarded based on vocal/instrumental ability (up to 40 points) and up to 20 points in the following three categories: group performance ability, stage presence, and audience reaction. There’s also an optional bonus of up to 5 points for those performing original music. 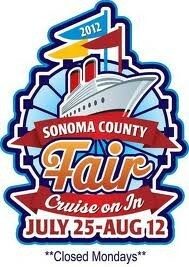 And sweet prizes await—first place takes $1,000 home, along with a trophy and a contract to perform on the Park Stage at the 2013 Sonoma County Fair! Second place receives $500! Third place receives $250! What’s there to lose? Sign up before Saturday, July 21! Age: All performers must be between 12 and 24 years of age. Additionally, at least two band members must be 12 — 18 years old, and no more than two members can be between 18 and 24. Be careful when you apply: Once the Entry Form is filled out, each act entered must only perform with the people listed on it. No changes or substitutions will be allowed. Individuals can only perform with one act during the entire competition. Don’t be late: Contestants must arrive at the Community Theater (Redwood Theater) by 6pm on the day of the contest, Saturday, August 11. The act: Acts must be performed live—vocally and/or instrumentally. No props or special effects can be used otherwise. A professional quality drum kit will be provided and contestants are expected to use that rather than their own. Watch the clock: Acts are 20 minutes total, including set-up, performance, and tear-down. Have good taste: No music or lyrics that the Sonoma County Fair and its representatives considers offensive may be performed. Be original: If contestants perform their own music, they can receive extra 5 bonus points from the judges. Music eligible for bonus points is any piece that is written or co-written by at least two band members. And don’t lie about it either; any band claiming to be playing their own music may be disqualified if a copyright exists for the music that does not name a member of the band as author or contributor. So what are you waiting for? Rock out! To enter, email specialevents@sonomacountyfair.com with BATTLE OF THE TEEN BANDS in the subject line. Include the name of a contact person, mailing address, phone number, email address, the name/age/instrument of each band member, as well as a photograph and demo. Deadline is Saturday, July 21.